Didn't get an A-grade in biology when you were a child? Yeah, neither did I. Sometimes kids (or adults) just need a push in the right direction, and that's where Biochemies plush dolls come in--they make science fun! Biochemies are an exciting new toy that will allow you to learn and play at the same time.The creators behind Biochemies are currently seeking help on Kickstarter, a crowdfunding site. 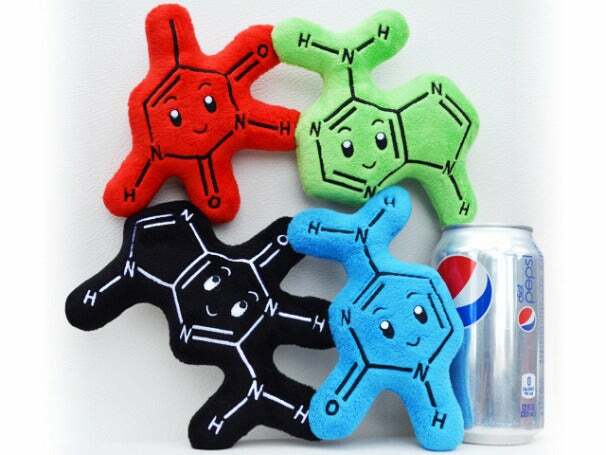 The first Biochemies to come out of the new company will be a set of DNA molecule plush dolls that actually interact with each other, with magnets at specific locations where they would normally hydrogen bond. The first dolls will accurately represent the four base molecules in our DNA: adenine, thymine, guanine, and cytosine; the first two and the last two interact with each other, respectively (e.g. guanine and cytosine form three hydrogen bonds between each other). Each doll is about 6 inches by 6 inches by 1.5 inches. Jun--the creator of biochemies--says that if the product is successful after producing the first small batch of dolls on Kickstarter, she hopes to expand and start working on other science toys. Personally, I can't wait to start building the building blocks of life when I should be working; after all, who doesn't want to play with furry DNA strands? If you think these are fun and educational, you'll also be interested in GIANTmicrobes--fun and lovable plush microbial critters, and you might even try to give your lover a virus. Editor's note: James, put those dolls down and get back to work! GeekBytes: Do Furry Microbes Dream of Electric Sheep?